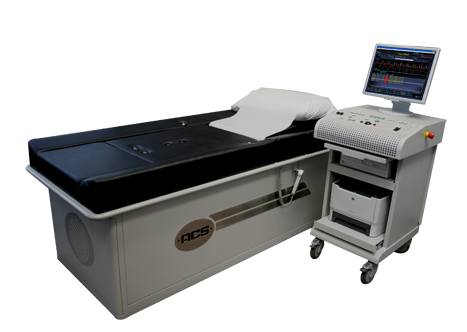 External CounterPulsation (ECP) is a non-invasive procedure that may reduce the symptoms of chronic angina by stimulating the formation of small branches of blood vessels (collaterals), which circumvent the blocked arteries. Counterpulsation occurs while the heart is resting (diastole). It is during diastole that our CardiAssist system actually pumps, sending blood back to the heart. Air is pumped into a series of cuffs placed on your calves, thighs and buttocks. The cuffs compress your lower extremities in sequence (like a wave) which increases blood flow back toward your heart. The inflation of these cuffs is timed to your heartbeat so the blood arrives at precisely the time the heart relaxes. A fraction of a second before your heart beats again, the cuffs are instantaneously deflated, enabling the blood in your heart to be pumped (systole), with minimal resistance, into your now empty blood vessels. This decreases the amount of work your heart must perform. When used for an FDA approved (“labeled”) indication ECP is generally covered by Medicare and private insurances. I walk better, sometimes without my cane for short distances. 75% improvement with my varicose veins and I am ¾’s of the way done with my treatment. Watch this video from YouTube to learn more about patients across the country and their experience with ECP therapy.